Livin’ Large Productions, LLC is a multi-faceted premiere entertainment company specializing in original productions of theatre, film and television based in New York City and Los Angeles, CA. In our 18 year history, we have collaborated with directors, actors, producers, editors and more to produce inspiring, creative and passionate content. Our Off-Broadway plays have included Neil Simon’s Star Spangled Girl, Lee Blessing’s Down The Road, John Patrick’s Suicide, Anyone? and David Mamet’s Sexual Perversity in Chicago. In Sexual Perversity in Chicago, Dan Fogler (who starred in and directed the play) went on to win a TONY Award for Best Male Actor in a Musical in 2006 for The 25th Annual Putnam County Spelling Bee. We are currently releasing, on CBS Sports Network, our first major motion picture, Born To Lead: The Sal Aunese Story. A sports documentary based on the true, inspiring and uplifting events of the late University Of Colorado quarterback Sal Aunese, who died of stomach cancer during his senior year in 1989. 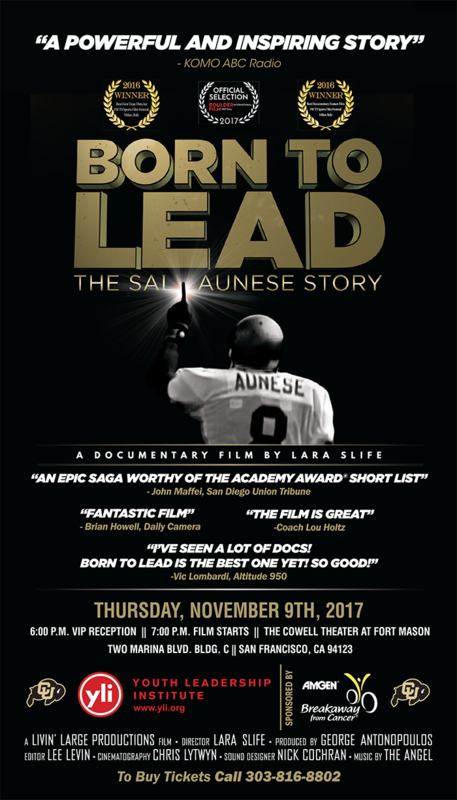 Born To Lead:The Sal Aunese Story achieved ‘Qualification Status’ for an Academy Award for Best Documentary Feature Film for the 2018 Season. Livin’ Large Productions has received praise from the NY Times, NY Post, Variety and LA Herald for their Off-Broadway shows and are set to return back to stage coming in 2017 for a new production. Livin’ Large Productions has received praise from Bleacher Report, The San Diego Union Tribune, KOMO ABC Radio, Altitude AM Radio, The Daily Camera and many, many other news outlets for the documentary feature film, Born To Lead: The Sal Aunese Story.